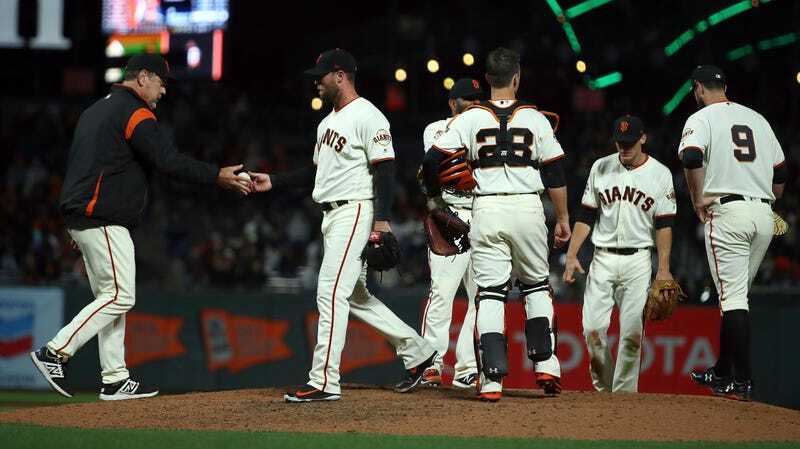 Giants reliever Hunter Strickland was very definitively Not Mad while exiting the eventual San Francisco loss last night. On his walk back to the dugout after blowing his team’s lead, Strickland exchanged words with Giant-killing Marlins outfielder Lewis Brinson after Brinson both tagged Strickland for a game-tying hit and also had the gall to be happy about it. We’ve long wondered what, exactly, is Hunter Strickland’s deal. But after this broken hand that feels like the logical step up from his 2017 payback pitch for a 2014 Bryce Harper playoff dong and this more recent one-sided grudge with Brinson, I think I have an answer: He actually is mad.